And my bill when I had my engine replaced (slight housing warp from localized heating after my cat clogged) was $54 for 2 accessory belts. I had forgotten to tell them that I had the belts sitting in the car, so I got charged for the needed replacement. They will re-use anything you have already, including plugs, wires, coils, though if they deem that they are not worth re-using, you will get billed for it. It's a good idea to replace the common items yourself before going in for testing to avoid a later over-priced dealer charge. Honestly, the answer to your question is both true and false, that Mazda's poor design in some areas can lead to the early demise of the engine in an RX-8. Of course, with the Series 1 engines like your car has, they decided to give two oil injectors per rotor housing a try. Don't really know why they went that way when the previous engines all had 3 oil injectors per housing for so many years before. I'm no expert on RX-7 motors, but I'm pretty sure they only had 1 oil injector per rotor. They went to 2 injectors on the series-1 renesis motor, in part, to address corner seal lubrication, then went to 3 injectors on the series-2 to address perceived insufficiencies of the previous series. Incorrect regarding RX-7s. 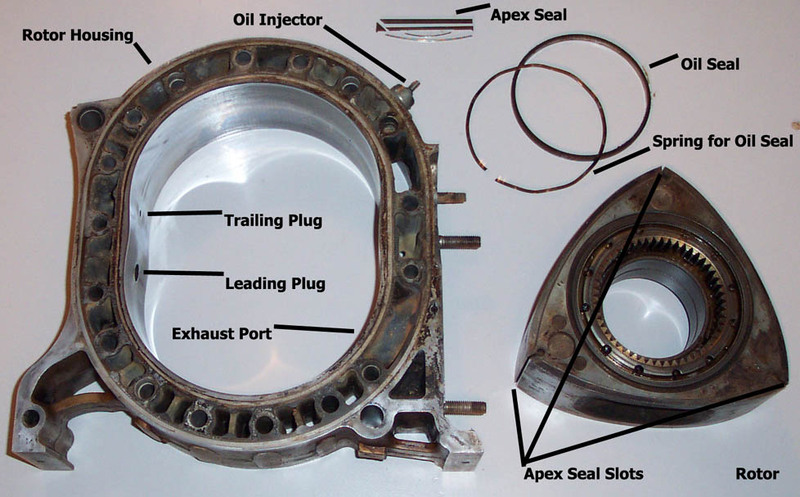 The Series 1 RX-8 is the only rotary WITHOUT 3 injectors per rotor. All prior RX-7s and the Series 2 RX-8 have 3 injectors. All prior rotaries and the Series 2 RX-8 have also had standard oil pressures upwards of 150-180psi. The Series 1 RX-8 was dropped to under 100psi. It is not known why Mazda deviated from the prior methods, but they clearly realized it was the wrong way when they returned the injector counts and oil pressures of the RX-7s for the Series 2. 66% of the Toyota Corolla's I've owned have had engines that made it past 90,000 miles. 100% of the RX-8s I've owned have had engines that lasted more than 90,000 miles. RX-8s are more reliable than Corollas. Yay, so is my 2004 (replacement) engine at risk because of this? Or did Mazda compensate somehow with it's flashes or something? That's not necessarily true. There are any number of changes in the Series 1 Renesis compared to earlier rotary engines; changes that make the Renesis, by far, the best rotary engine ever. Since I don't believe any of us are professional rotary engine designers (and hey, we all like to believe we could coach our favorite NFL team better than the real coach; see my signature), explanations for these changes are largely conjecture; changes to injector counts and oil pressures could well have been some of the improvements Mazda made that, for one reason or another, could not have been made decades ago. Yes, Mazda may have revised the Renesis to improve its design, but for all we know, those revisions were made to address the distinct possibility that most owners fail to maintain their engines properly; changes might have been made to simply increase the margin of error for owner neglect. If that's true, the modifications won't affect the owner experience for those who maintain their engines as prescribed. That theory makes as much sense as any other. Last edited by New Yorker; 05-01-2012 at 10:00 PM. Where are the other two injectors? chrome flake badly, coolant o-ring groove is cut into the rotorhousing, not the iron. Small exhaust port. Not useable in any 86+ engine because of coolant seal discrepancy. chrome flake and compression surface wears moderately, most of these aren't in very good condition if they have over 100k miles. They're usually fine to reuse in a street nonturbo engine, but not for something like a modded t2 or an FD. They have the noise diffusers in the exhaust, so you can either cut them out or swap sleeves entirely. The port itself is identical. Plug timing is different from 89+, and these do not have the casting above the T plug for the knock sensors. Required 4 oil injectors for lube. same as above, except with smooth exhaust port. Also they have an additional coolant passage where the LIM bolts up, on FC's this feeds water to the stock turbo through the LIM which has a drilled passage. To use this housing on a nonturbo engine or an FD engine you have to block off this coolant passage, usually by tapping and plugging. chrome flakes and wears very mildly, holds up quite a bit better than 88 and back due to a change in coating. Still required 4 oil injectors for lube. Plug timing is changed, and matches the FD housings. All 89+ housings have the holes for knock sensors above the T plug. The NA housings have the exhaust diffuser issue that must be addressed. The NA housings do not have the coolant passage at the LIM. same as above but has smooth port exhaust and the coolant passage at the LIM. went to a better internal coating for slightly less wear, also required less lubrication, so they went from 4 oil injectors on all previous models to 2 on the FD. Smooth port exhaust sleeve, same as s5 NA in all other regards. yes, you can mix and match housings of all kinds, this is the beauty of 13B engines after 86. You can purpose build an engine for many different requirements because of this. You can do complete rotating assy swaps, change irons for different intake port configurations, or improvise out of necessity. Last edited by RIWWP; 05-02-2012 at 08:30 AM. like a gazillion!! (close to 300K) miles on his original engine. I just took my 04 in to have a compression test done just bc i knew my warranty expires next month... failed the test and got a new motor, didnt need any records of any sort. but i payed 600$ for new motor mounts and a new clutch since i didnt have to pay labor. Happy to report that all worries are put to rest! Took the car into the dealer today to have the clutch pedal checked and a compression test done. All's well. I will now resume taking proper care and driving like I stole it! Look forward to seeing it turn well past the 100,000 mi. mark. Well just to add my two cents, I have had my 04' for 5 years now 62k of 69k have been from me about 43k have been FI(forced induction) and she is still running strong(praying). I would def agree with what many have said rotaries can fail abruptly however proper/timely maintenance and proper tunning do play a vital role in the longevity of a rotary engine's life. Cool, glad to see your ride is running strong. BTW, it's spelled gauges or gauge, not gage or gages. I would be very happy to get 70,000 miles from an engine. If Mazda was basically NASA, they could develop an ultimate rotary engine. It would have all the necessary breakthroughs in science for power, reliability, and efficiency. It's just that nobody would be able to afford it. Realistically, after an engine failure(s), I think most people end up selling the rx8 shortly after repair. Not sure how many of those people are still here to respond to your question. Since it had less moving parts, I once believed in the reliability. But there were too many other factors at play and modes of failure. Hope you are prepared for the worst, is all I want to get across. Roll of the dice and your own best maintenance practices. Last edited by User24; 08-30-2012 at 01:22 AM. I literally just read all of this... even the links... both links refer to 4 oil injectors until later on like RIWWP's said. Stinksause, your's brings out two PAIRS of oil injectors which equals four (4). I'm glad I was able to read all of that though as it helps me understand the rotary system a little better. What's with your guys' mileage on RX8s? I get 20 almost every time... and I floor it. 18 with the original engine. 21.3 average last 10 fillups with the replacement engine (it keeps getting better, 20.1 over it's entire 15,000 miles). ... BTW, it's spelled gauges or gauge, not gage or gages. Actually, it can be spelled either way...see link. gauge - definition of gauge by the Free Online Dictionary, Thesaurus and Encyclopedia. And professional makes mistakes too, there were so many times in rotary history that us "non-pros" actually designed and found stuff thats better than mazda's own solution, and mazda actually use then in the next design. Ι guess that this topic is discussed many times before all the info is known. Worries about renesis engine life was one of the most popular topic concerning RX-8. NASA's failure rate for the Shuttle was just under 2%, which is definitely less than the percent failure rate bandied about for Renesis engines. But their Shuttle astronaut fatality rate was around 4%...which I think is a lot higher than RX-8 occupant fatality rate.